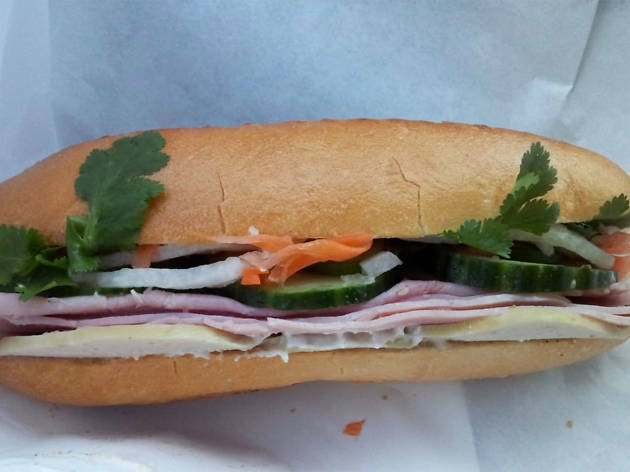 This Vietnamese sandwich is all kinds of wonderful. 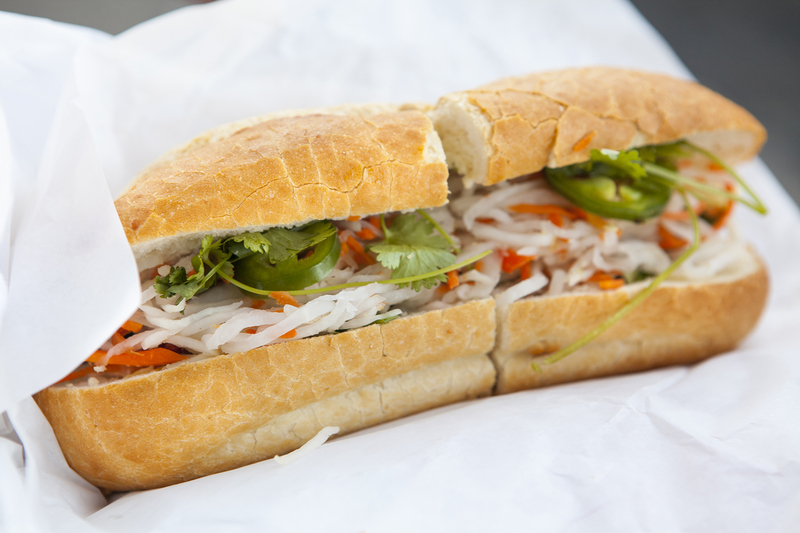 Here's where to find the best banh mi in the city. 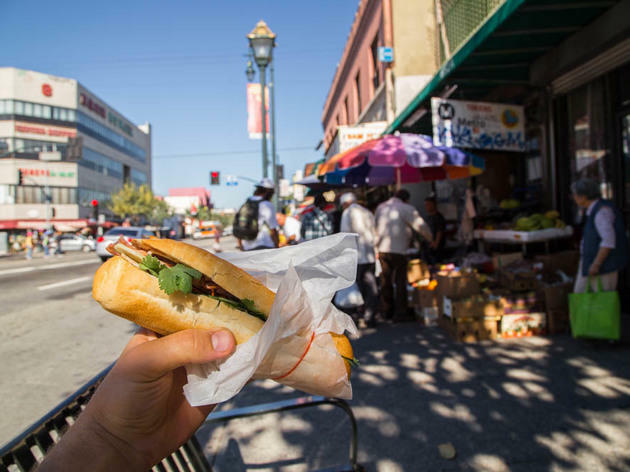 Out of all the options we have to choose from to find cheap eats in Los Angeles, banh mi just might give us the most bang for our buck. 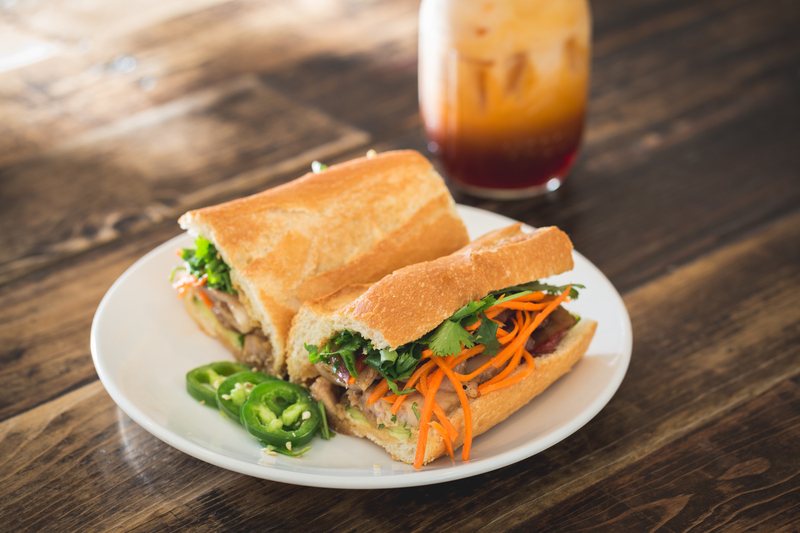 Consider the Vietnamese staple: a fusion of Southeast Asian flavors wrapped up in a French baguette, a blend of meat and pickled veggies and pâté that start at $2.50. 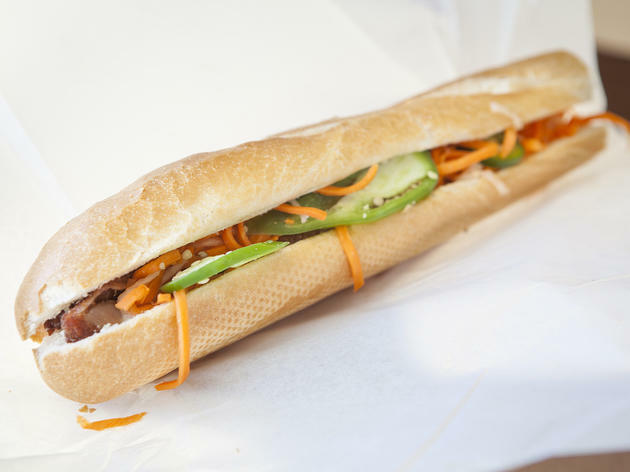 Sure, there are the exceptions—a Culver City pick that runs $11, for example—but the banh mi that made our list are worth every penny. Remember the requisite Vietnamese iced coffee and you're golden. 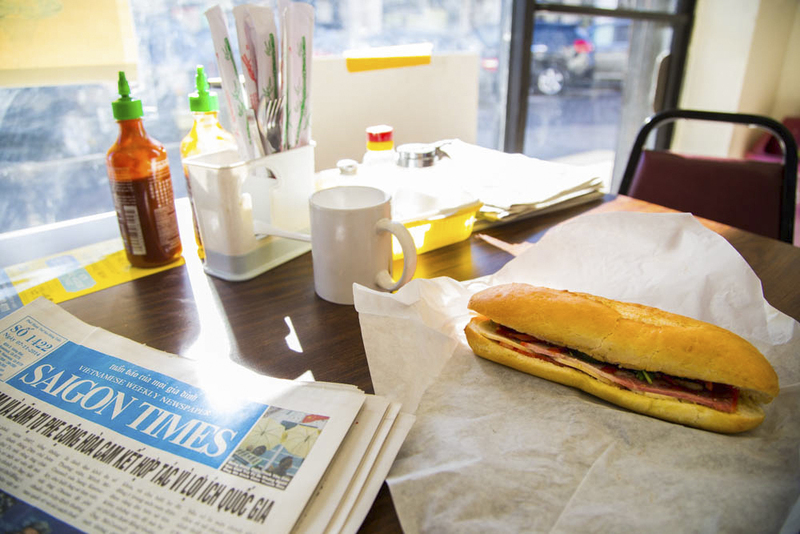 RECOMMENDED: See more delicious coverage on sandwich shops and sandwiches in Los Angeles. 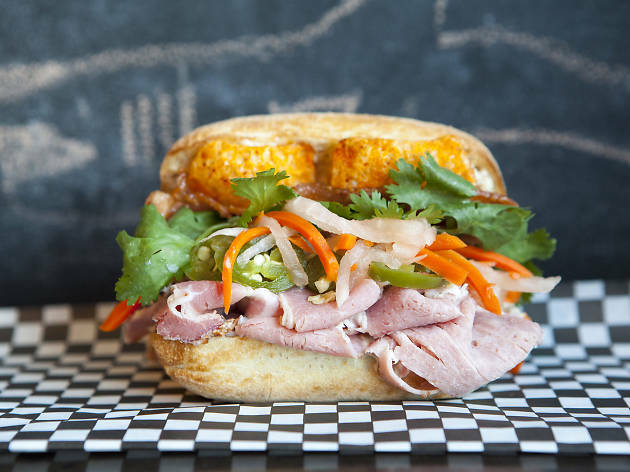 It may be an unlikely spot for a banh mi shop, but make no mistake—this Loz Feliz eatery is serving quality Vietnamese sandwiches. 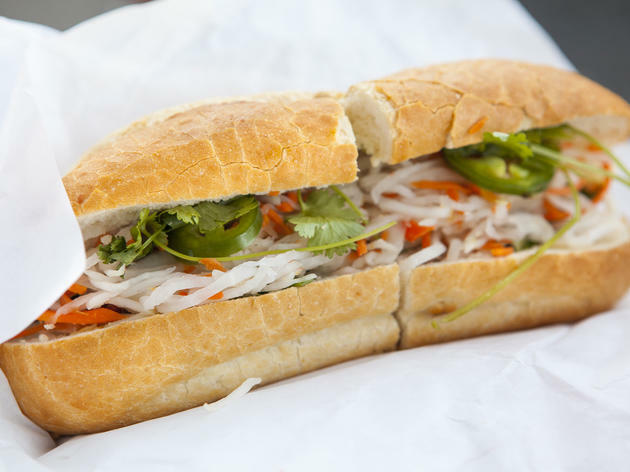 Open during a short lunchtime window (noon-3pm), the nondescript O Banh Mi is so easy to miss, you'll likely pass it a few times before you find it on the west side of Hyperion. 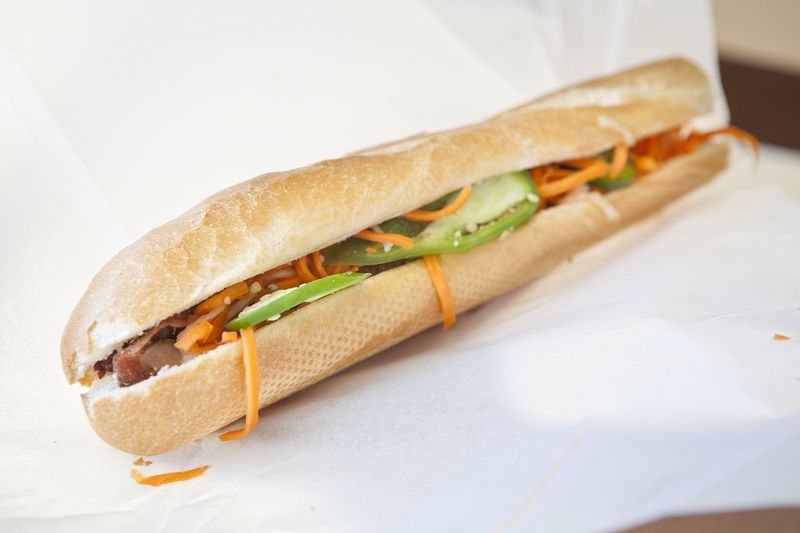 And yet, you probably won't find a more legit, traditional style banh mi in the area. Fridays yield a special pig roast variety, which sells out every time (get there early!). Expect Loz Feliz prices for each sandwich, but if you're local, it's well worth it. 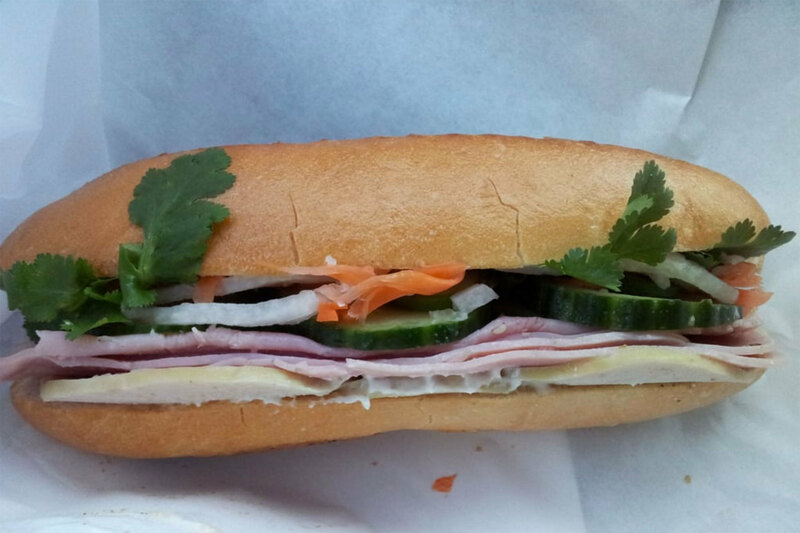 As the name implies, the true strength of Saigon’s Sandwiches & Bakery is the bread. 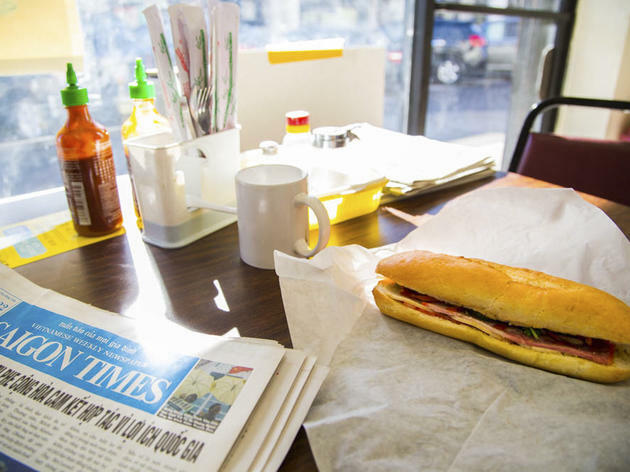 Here you can find some of the best dough in the SGV, with a loyal fanbase that regularly files out with a baguette in one hand and a banh mi in the other. 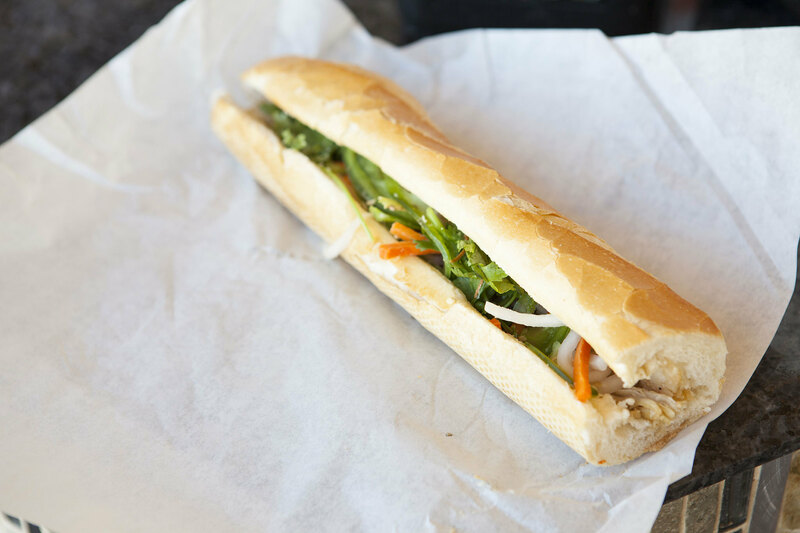 You won’t find as many Vietnamese snacks here to round out your order (though they do have some delicious crispy egg rolls), but that’s simply a consequence of focus on the sandwiches. The bread, whether baguette or round roll, has a beautifully crusty outside that breaks open to reveal a soft, airy center, otherwise known as “the crumb." The fillings are traditional, including grilled pork, sardines and meatballs, and come with a delicious pâté, but the veggies and meat helpings tend to be a tad on the skinny side. This Highland Park staple from Diep Tran serves twists on Vietnamese favorites that have drawn a loyal following. 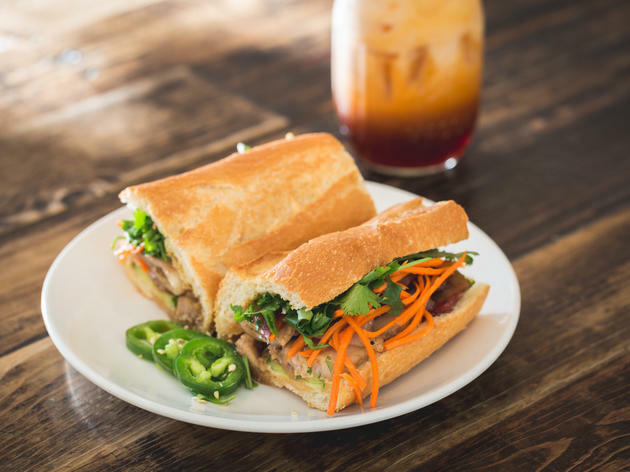 Of course, this includes all four varieties of banh mi, from galangal chicken and slow-roasted pork to roasted oyster mushroom and cauliflower, the vegetables of which are sourced from Underwood Family Farms. The sandwiches also come with a side of slaw or truly addictive spicy fries. 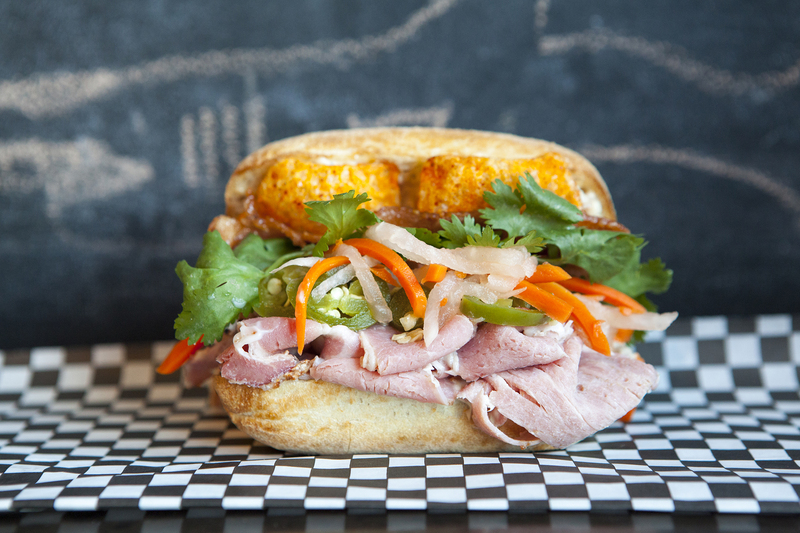 Want more meat in your banh mi? Add on some Red Boat bacon for an extra $2.50. The banh mi at Banh Mi My Tho are at the top of the San Gabriel Valley line-up, thanks to their hard-to-find ratio of pickled vegetables to meat to bread: they don't skimp here. Only serious banh mi eaters welcome, as Banh Mi My Tho is a small storefront with other snacks and drinks available, but no place to sit besides your car. See that magic yellow sauce in your baguette? It's a house-made egg yolk mayonnaise, a truly addictive agent. 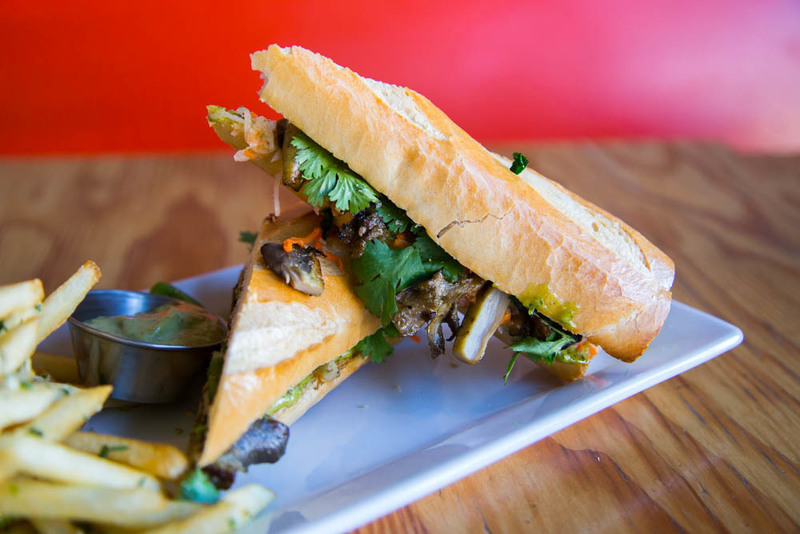 The BBQ meatball, charbroiled pork and charbroiled beef banh mi come with peanuts for that perfect nutty crunch. Omnivores, as well as veggie and breakfast lovers, will fall for the banh mi with added egg. Don't forget the iced coffee—some of the best and strongest in the city. 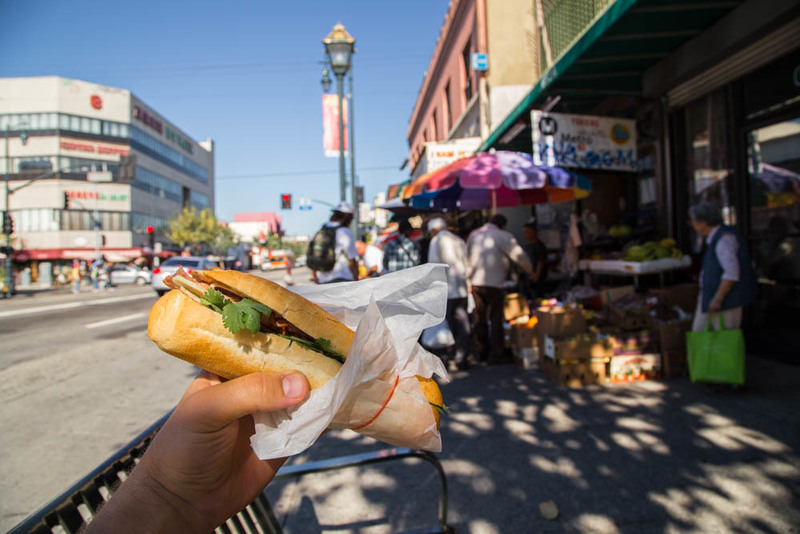 As one of the two viable banh mi options with SGV prices available in Chinatown, Buu Dien is a great reason to curtail your trek eastward. But unlike Banh Mi My Dung, Buu Dien has plenty of sitting room and a bigger menu of Vietnamese dishes, namely pho. Consider their chicken liver pâté, funky in all the right ways and taking the mere sandwich, with its more-than-decent baguette, pickled vegetables and meats, to another level. Everything you never thought possible with two dollars and fifty cents. 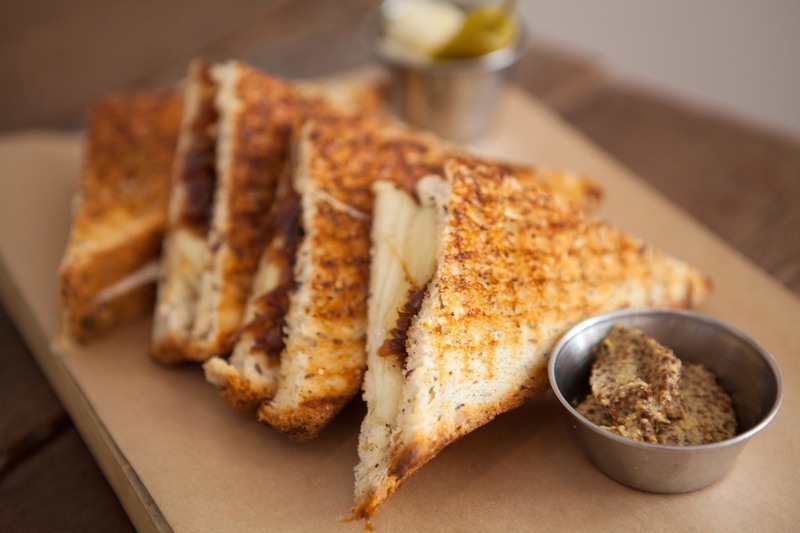 Michael Voltaggio has transformed ink.sack into Sack Sandwiches, a stand-alone sandwich shop offering inventive combinations between two slices of bread. 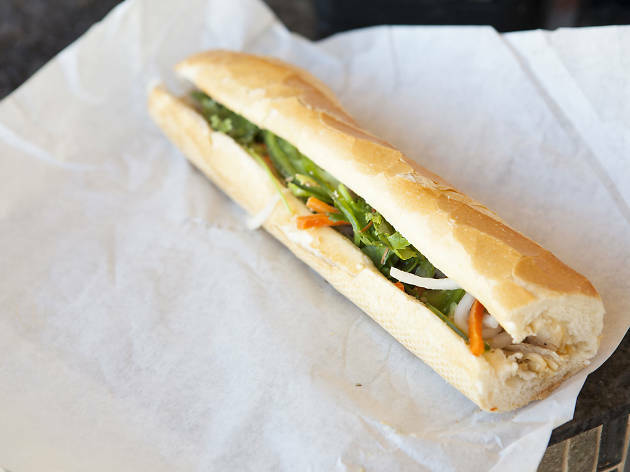 Yes, you'll find banh mi here—and even a vegetarian version with tofu, at that—but many would be hard-pressed to actually call it one. It's no matter that it's not traditional, because this is one of the meatiest odes to the Vietnamese classic that you'll find, thanks to slices of pork shoulder and bacon and crumbles of chicharrones. Besides, it's got properly pickled daikon and carrots, as well as cilantro. And while the bread used at ink.sack is not traditional, it is solid, with enough crunch to satisfy any sandwich connoisseur. Just around the corner from Buu Dien is Banh Mi My Dung, also selling banh mi for just $2.50 each but at a no-frills storefront deli (without any real seating area). The bread here, which is made in-house everyday, is especially stellar, with extra attention paid to heating up your baguette while it’s prepared. 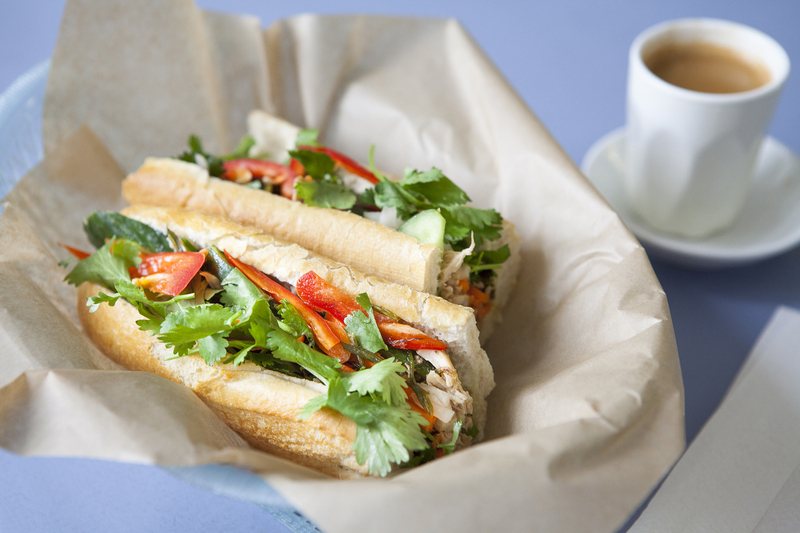 Pick up a combination banh mi for the best of all the cold cut meat fillings, as well as an iced coffee and some snacks. Also great: the pâté sandwich and chicken. Or just get them all. You can spare that extra cash. Banh Mi & Che Cali doubles as a sandwich shop and sit-down diner dishing out Vietnamese eats such as pho, but the order of business here is their banh mi. 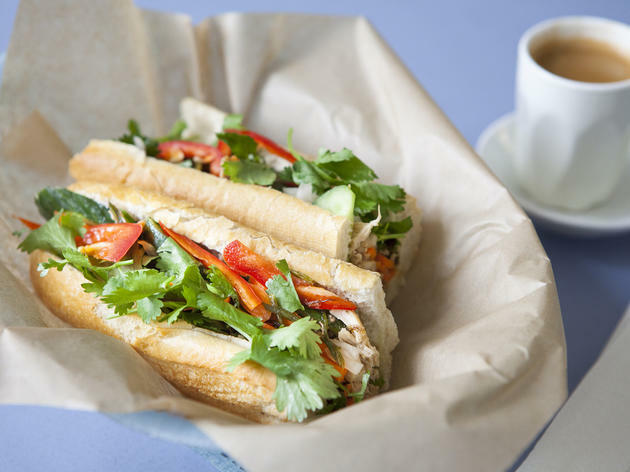 They offer two different breads: a shorter French roll which they dub as “banh mi,” but also the slimmer, longer "baguette” with the same filling choices. For the best possible sandwich, skip the “buy two get one free” sales pitch on their shorter varieties, which yield more bread than you’ll want, and order the “baguettes” with the filling of your choice. The most popular picks here are the ham and meatloaf for a combination of meaty goodness, and the BBQ pork for those who like their meat slightly sweet. 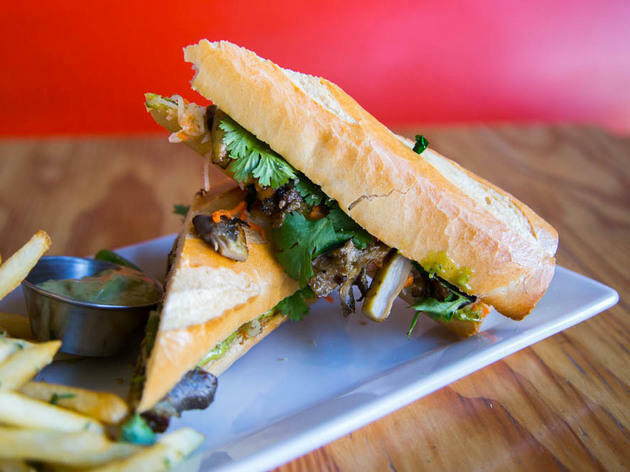 At Phorage, a modern Vietnamese restaurant in Palms, you'll find stellar meats in their fantastic Westside banh mi, putting to rest any fears of getting shortchanged on filling or failing to get your money's worth. And the bread is no slouch, either—it holds a perfect balance of ingredients, whether it's Kurobuta pork belly or Jidori chicken. If you're in for a rich, meaty treat, go with the former. The latter is also super flavorful and perfectly seasoned, a marriage of flaky-soft bread, pickled vegetables, cilantro and barely-sweet, free-range chicken. Kien Giang Bakery (also known as KG Bakery) is tucked away from the street; walking inside, you might wonder if the sparsely stocked bakery is on its last legs. But it's not—it's doing just fine, thank you very much—and you'd be wise to stop in for one of two things: a custom cake or banh mi. The made-to-order cakes are elaborate, whimsical and decadent, while the banh mi sandwiches include a traditional, French, Californian and vegetarian variation. A small price bump upgrades your sandwich into a combo meal with chips and a drink—and you'd be wise to take it. Thinking about grilled cheese instead of banh mi? 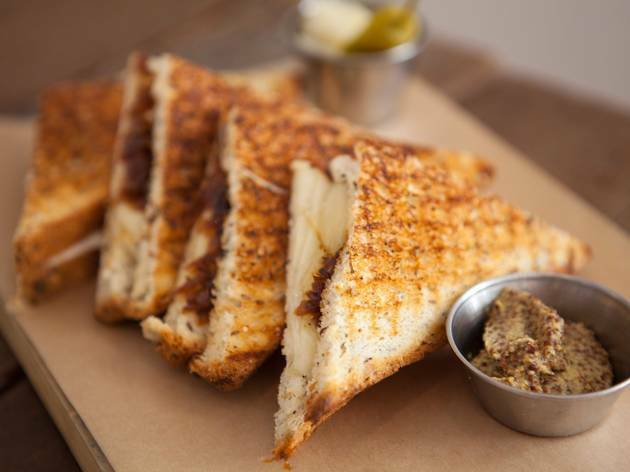 The best grilled cheese sandwiches in L.A.
Swap out your banh mi for a classic grilled cheese instead.